Another question I get asked often about is the city’s budget. While we are almost a $9,000,000 annual budget, most of that is related to the incomes and expenses associated with our different “profit centers” or “Enterprise Funds” as they are called within the government functions. Basically, we attempt to make each enterprise fund pay for itself. In other words, we want the water fees to be enough to cover the costs in the water department. But some expenses do not have income associated with them. For example, we pay the sheriff’s department almost $600,000 per year. But the fines collected go to the county, so we have no associated revenue’s with that expense. So what pays for items such as that? Well, those are paid out of the general fund. The general fund gets its revenues from any profits from the enterprise funds (over and above the costs), as well as property taxes and Local option sales taxes (and some other smaller taxes), and Franchise fees, and insurance premiums, and some other things. The Net profit from the services that we offer (ex, Water, Gas, Trash Pickup, etc) is slightly over $500,000 (most of this is generated from our ability to sell Natural gas. We receive almost another half million from Property taxes. Those two income sources combined amounts to almost half of the net revenue of the City. As the chart above indicates, we also get significant monies from LOST (Local Option Sales Taxes) 17%, Insurance Premium Taxes 13%, Franchise Fees 12%, and Vehicle Title Taxes 5%. We also get another $120,000 from fees such as Business licenses, Fines, Hotel/Motel Taxes and our animal control expenses, among others). You can see elsewhere in this booklet the expenses associated with the enterprise funds, but there are lots of other expenses as well. 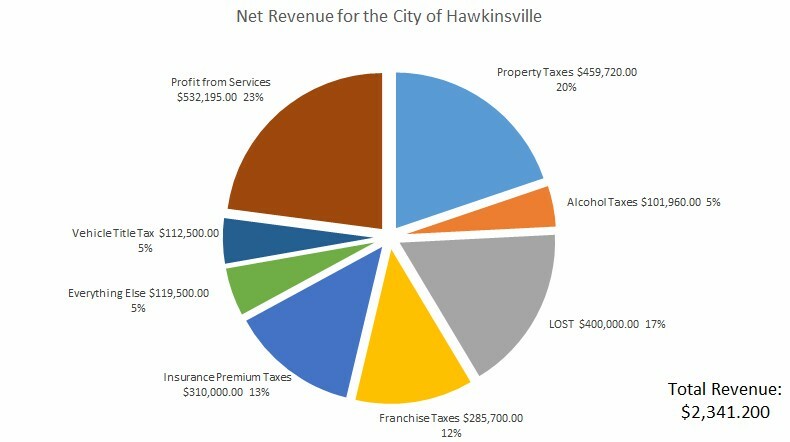 Expenses associated with overall goals of the city such as public safety and streets and roads. In order to control escalating costs as well as a better service delivery strategy for our citizens, we have consolidated many services with the County. While we no longer have a city police department, we still pay the county Sheriff’s office almost $600,000 a year to provide a level of service to our citizens. The city/county fire departments combined but we still pay almost $200K per year for fire/EMA (Emergency Management Agency) protection. We pay almost half a million a year on improving our city roads and of course, these roads produce no income. (The county does reimburse half of Animal Control Expense) . Of course there is overhead such as administration salaries, utilities, etc. that also have to be paid. There are many hard expenses that don’t bring in Revenue. And Even when we get some State Grants like the CBDG (Community Block Development Grant), there are often some expenses associated with it that go above what the grant gives us. Basically our goal each year is to set the fees associated with each service such that it pays all the expenses within that fund. Gas is the one profit center does help us offset property taxes. The city’s budget year runs from July 1 to June 30 each year. 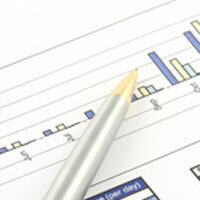 We begin planning the next fiscal year budget in January each year. Our total budget (Enterprise funds and general) is $8.9 million. The city budget is where we outline our priorities for the coming year. How much money should we put in street cleaning? How much in road maintenance? How much in grass cutting? How much on improving blight in our community? We would love to fund everything, but we also have an obligation to keep your taxes as low as possible. And actually, we have done a pretty good job at that. The city’s mileage rate of 5.6% has not changed since 1987. Sure, we’ve seen some years of increase revenue as the tax digest has increased, but we have not increased your mileage rate. We have also stressed consolidation of services with the county whenever we feel that the consolidation will bring about lower costs and/or increased services to our citizens. For example, we pay the county $18,000 a year to collect the city taxes on the same tax bills as the county taxes. This means that you only have to write one check each year. Mail it to the County and they cut us a check for our portion. We have combined our Animal Control, Recreation Departments, Police/Sheriff, Fire, EMA, 911, Codes Enforcement, Tax Collection. The budget is the most important legislation that we pass. And each and every year we pass a BALANCED BUDGET. Something that the Federal government needs to learn to do. Even as we are implementing this year’s budget, we are planning next years and auditing last years. Now that the election is over, let me share my thoughts on the consolidation issue here in Hawkinsville / Pulaski County. I really did not want to say much prior to the election. Whatever I said, (or say now probably) would have been construed by the pro-side as being against consolidation and would have been construed by the con-side as being for consolidation. As a sitting official, I really felt that I should remain neutral. I think the citizens of this county should have whatever form of government that they want – therefore, I voted to allow the citizens to vote in the Nov. 5th referendum to decide that question. Ironically, now that the election is over, I am probably getting asked more about it than before the election. First, let me clear up (or attempt to) the confusion about – “City people got to vote twice”. There were two completely separate elections taking place. The city residents had to decide if they were in favor or not in favor of consolidation. The county residents (which is everyone that lives in Pulaski including those within the city limits) also had to decide if they were in favor or not in favor. So if you live in the city, it was not exactly that you voted twice in one election, but you voted once each in two different elections. Whether you agree or disagree that is how the Secretary of State’s Office told us to do the election. The Secretary of State guy quoted as saying it was illegal was probably simply asked if it was legal to vote twice in an election. This is the same way the vote was done in 1999 as well. A good analogy is this: if COKE and PEPSI were going to merge, and you owned stock in BOTH (city AND county resident), then you would get to vote in the COKE election and the PEPSI election. When this issue first came up of the consolidation, I was certainly not going to stand in the way, because again, I feel the citizens should have whatever form of government that they want. However, if we were going to go down that road, I wanted it done right. So we (city and county governments) appointed a 16 person study committee to look into this idea. We had young, we had old. We had white, we had black. We had men, we had women. We had business people, we had farmers. We had a great cross representation of people on this committee. We then provided them the resources necessary to fully explore this issue. The city/county accountant attended those meetings. The city attorney attended those meetings. City/County personnel attended those meetings. City/County officials attended those meetings when asked. We had the Regional Commission out of Macon facilitate the meetings. GMA (Georgia Municipal Association) and ACCG (Association of County Commissioners of Georgia) attended many of the meetings. The group was tasked with exploring the avenues, the good, the bad, the financial, the personnel, etc. etc of this issue and to report back to the governments if they would recommend we pursue a consolidated government or not. This group met for over a year. They finally concluded that the majority of the group felt that we SHOULD pursue the consolidation. So both the city and county governments then changed the group from a study committee to a charter commission. They were to formulate the recommended “look and feel” of the new proposed government that would govern the consolidated “Hawkinsville / Pulaski County’. They wrote the charter which defined things such as the number of commissioners, their terms, the rotation, the pay. They came up with the proposed districts, and all the other items that had to be addressed. The proposed charter was then sent back to the local governments, where they were deemed appropriate and the charter was then sent to the Georgia State Assembly for approval. After they approved, and the Governor signed it, it was then placed on the ballot for the November 5th election. As with any issue there are pros and cons. As with many issues there are disagreements as to the assumptions made. The pro-side was proclaiming that the consolidation would save lots and lots of money. My personal belief is that it could have saved some money over time. Not a whole lot, but some. Economies of scale and increased efficiency were sure to happen. However, at the same time, the merger itself would have been expensive. Simply merging the two general ledgers and accounting systems would probably not have been cheap. Long term, we would be managing ONE accounting system rather than two, but short term, we have to create the system to do it. We have ALREADY functionally consolidated many departments with the County, so much of the savings of a consolidated government have ALREADY been realized. 911, EMA, FIRE, POLICE, ANIMAL CONTROL, TAX COLLECTIONS, ECONOMIC DEVELOPMENT, RECREATION DEPARTMENT, BUILDING AND CODES ENFORCEMENT have all been functionally consolidated with the county over the last 10+ years. I think a positive would have been that we could project ourselves as larger. When a potential industrial prospect inquired as to the size of our city, we could report 12,000 rather than 4,000. A positive would have been some reduced bureaucracy on items that previously would have had to obtain both city and county approval. However, for items requiring JUST county approval, you would have had to convince 3 of the 5 county commissioners rather than the current sole commissioner. For many people that do not like that we have a SOLE county commissioner, a board of 5 was more appealing. Some on the con-side were proclaiming that suddenly the county would have to conform to city ordinances or pay city taxes. That was not accurate. All ordinances applying NOW to the county would have remained to the county, while all ordinances applying just to city residences would have remained applying just to city residences. All city taxes collected would have remained in the city. The county was NOT suddenly going to have to pay city taxes. Their dirt roads were NOT going to suddenly be paved, and they were NOT going to suddenly have the option of utilizing city services such as water or trash pickup. I think consolidation would have removed one barrier to city annexation. NOW, we must not only have the proposed properties’ owner’s approval, but we must also have approval from the county. I suppose since the consolidated board would have represented both city and county, the county approval would not have been necessary. Depending on how you feel about the possibility of annexation, this could be either a pro or a con for consolidation. On the negative side, I like the fact that we are all (city and county officials) elected at-large. I like that I feel I get to represent ALL of the residents of Hawkinsville, and not just my little “district.”. I also like the fact that the way it is now, 100% of the people voting on city taxes are required to LIVE within the city and pay the taxes that they might propose. Under the consolidated government, it would have been possible for only some (or even none) of the elected officials to have to pay 100% of the taxes they were proposing (if they lived in the county, but were voting on taxes or fees for the city district). There are many other valid arguments for or against the proposed consolidation. But the people have spoken. And we will continue as we were. I heard several residents proclaim that their reason for voting against consolidation was simply, “It ain’t broke, so it don’t need fixin'” There is some truth in that statement. Unlike many cities and counties across Georgia, our two governments work very well together. In fact, just this past Friday, Sole County Commissioner M.A. “Butch” Hall, myself, and Jerry Murkerson, the City Manager, were invited as guest panelists at a joint GMA/ACCG training session in Dublin, Ga. The training was on City/County Cooperation and we were presented as a MODEL for how to accomplish this. We have a great community. As with any group of individuals, there are differences of opinion. There are facts to any issues and there are incorrect facts about any issue. We will continue to work together, even when we disagree on some items, or some points. We all want what’s best for the community and our children. Finding the optimum route to get there is often a challenge and the route chosen is often debated. But the end-goal is hopefully the same. I would love to have your feedback on this post or any post…. The consolidation bill passed the House yesterday. As far as I can tell there were no changes to the charter as was presented. The following link will take you to the House site that describes the actions. Our next step is the Department of Justice. Consolidation efforts of Hawkinsville and Pulaski County moved forward this week when Rep. Buddy Harden introducted House Bill 286 which asks the state assembly to give it’s blessings of the potential merger. If this Bill passes, the consolidation agreement would then go before the Justice Department for approval. 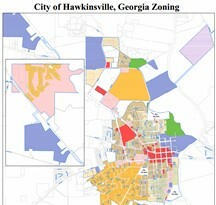 Assuming they approve, the measure would then be placed on a local ballot for our residents to determine if this is their future vision for Hawkinsville / Pulaski County. The measure could hit our local ballot as early as November, 2013. If it passes, the new government would then go into effect on January, 2015. There are many citizens that have expressed an interest in the city and county governments consolidating into one entity. This was previously tried in 1999 but the county citizens voted the proposal down. It passed in the city but lost in EVERY precinct in the county. In this post, I am going to try to detail some thoughts, concerns, and suggestions on consolidation. Personally, I have not made up my mind. I see some benefits and some concerns with this proposal. I will attempt to break down both my concerns and the potential benefits in this post. Benefit: SIZE Since we are only 4,000+ in the city and 8,000+ in the county (excluding the city), it probably makes since for a community our size to consolidate. There is no need to fight over resources when there are so few resources to go around. I can see an advantage when applying for grants or when presenting ourselves to a potential industry when we can present ourselves as 12,000 strong rather than 4,000 strong. For example, when we apply with DCA for a grant, one of the “blanks” is how many people will this impact. Indicating 12,000 rather than 4,000 has got to carry weight.